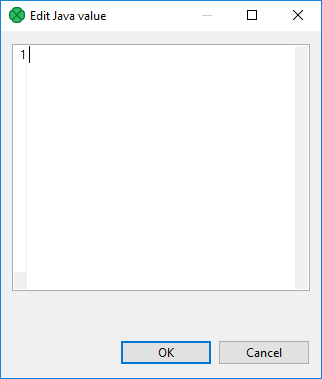 The Edit Value dialog contains a simple text area where you can write the transformation code in JMSReader and JMSWriter components. When you click the Navigate button at the upper left corner, you will be presented with the list of possible options. You can select either Find or Go to line. If you click the Find item, you will be presented with another wizard. 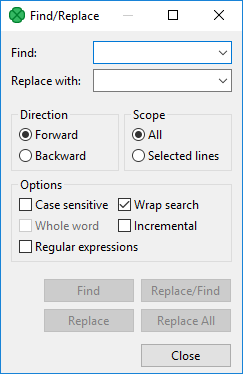 In it, you can type the expression you want to find (Find text area), decide whether you want to find the whole word only (Whole word), whether the cases should match or not (Match case) and the Direction in which the word will be searched - downwards (Forward) or upwards (Backward). These options must be selected by checking the respective checkboxes or radio buttons. If you click the Go to line item, a new wizard opens in which you must type the number of the line you want to go to.